I made these for Dark Mists great skin "Rise" Link .They have some pretty cool animations in them and are easy to see. I hope you like them. Special thanks to Dark Mist for trusting with these. RadialFX, Love the animations with this one.... the multiple pinwheels make it easy to see & use! Thanks! Randy, you are the cursor master! I bow to thee. yeah, what dwm said!! no body else comes close to doing as great a job as you do, my friend. Very nice. One of a few that I download. I don't blame DarkMist for trusting you . . . these are sweet! I'm not a big yellow fan but these are nice! 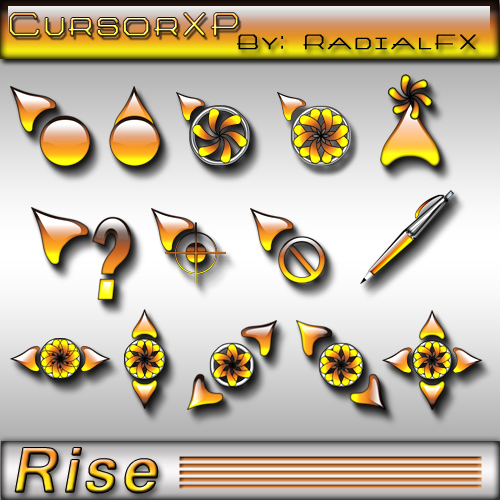 wow.... these cursors matches up perfectly with the Mean Machine Hoverdesk theme I've been working on! Uh yeah... top job on the animations, they are really smashing!! Thumbs up for ya, RadFX! Clearly, DM's trust was well placed. Great work!